When you getting close to the roof of the world in warm sunlight, you will be excited to find that besides the snowfields and deserts, there are really bloomed meadows, luxurious forests, swamps with cranes, and beautiful lichen on rocks and trees.The broad topology, the young geological history and the remote location of the Tibet Plateau reserved a very rich and unique botanical kingdom there.Nature granted numerous beautiful wild flowers to decorate the world's roof. 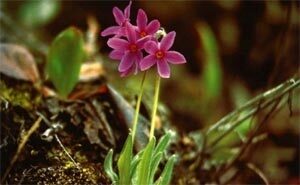 Many of these precious flowers are endemic to Tibet or Himalayas. They were generated or adapted to the special environment of Tibet plateau. 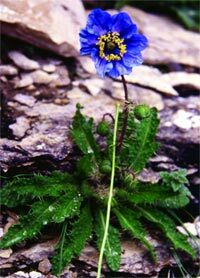 There are over 6,000 species of vascular plants in Tibet. 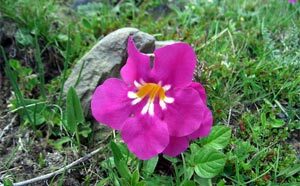 Including 190 species of Rhododendron, 120 species of Primula and 110 species of Gentiana etc famous high mountain plants. Rare plants like Paeonia ludlowii, Omphalogramma tibeticum, Mussaenda dicipiens, Calanthe metoensis and Cypripedium elegans etc. Since ancient times, the people of Tibet have depended upon plants and plant products as a mainstay of everyday life. Today, almost 90% of Tibetan rely on Tibetan traditional herbal medicine, with plants performing a vital role as arable crops, fodders, fruits and vegetables, fuel and building materials. Annual herb. 15～20cm tall, with brown-yellow or light yellow acantha. Basal leaf, lanceolate. 5～12 scapes. Single flower, 3～5cm, blue violet. Flowering: June to Sept. Cold, drought and barrenness tolerant. Extensive distribution in Tibet, on grassy slopes or screes, or between stones. West China, Nepal, Sikkim and north Myanmar. glabrescens Annual. 30～45 cm high. Cordate leaf, trisected.panicle. Deep blue flower, with a 1.2～1.6 cm spur. Flowering: July to Oct. Temperat-cool and mutrient tendency. Sinoendemic. From theeast part of Tibet, forestedge meadow, 2600～4200 m; northwest Sichuan, southwest Gansu and southeast qinghai. Beautiful flowers from budding until blooming. Belongs to Papaveraceae. Herbs, 15～60 cm high; stems caespitose. Basal leaves pinnate-divided. Cauline leaves similar to, but smaller than basal leaves, sessile. Inflorescences a cyme, terminal. Flowers orange, 4～6cm in diameter. Flowering: june to Aug. Resistant to coldness and drought. Distributed in south-middle Tibet. Growing on stony slopes of 3700～4300m alt. Also in northwest Sichuan, Nepal and northwest India. Perennial herb of Cruciferae. Erect rhizome. Shoot beneath 12 cm. Lanceolate or linear leaf. Raceme, 9 cm long. Pink or reddish purple flower, 1.5～2cm. Deeply violet-lined petal. Flower phase: June and July. Drought, cold and poorness tolerant. Endemic to the Qinghai-Xizang plateau. north Tibet, grassy slope, 4700～5200m. Northwest Sichuan, Qinghai and Gansu. Perennial. 5～10 cm tall. Heterophyllous basally. Single flowers. Corolla: the upper part blue, yellow-green veined; the inferior part yellow-green, blue veined and punctated; the inferior part yellow-green, blue veined and punctated; 4～6 cm long. Flowering: Aug to Oct. Cool and light tendency. Sinoendemic. Middle to eastern Tibet, 3200～4700 m, forestside or alpine grassland. West China. Perennial. 1 m tall. Arachnoid erioned. Terninal capitulum, 3～7cm. Rosecolour flowers. Flowering: Aug and Sept. Heliophiles, tolerant to cold and poorness. From the west to south Tibet. 3800～4400m, grassy slope, stony floodplain. West Himalayas. Short perennial herb of 10～20cm tall, erect long rhizome. Stoloniform leaf, pinnately divided. Short raceme, terminal; reddish purple (rarely pink) corolla, 5～6cm long. Flowering: June to July. Heliophiles, cold and poorness tolerant. Chinese endemic. Extensive distribution on the Tibet plateau. 4000～5000m, steppe or scree. Qinghai. Other ornamental Incarvillea in Tibet: I. compacta, integrifolial; I.lutea, yellow flower; I. beresowskii, golden yellow flower; I. altissima, light red. Rosette. Linear leaves. Rosecolour perianth. Flower phase: July to Sept. Cold hygrophiles, heliophiles. Large area of Tibet, 3100～5400m, alpine grassland, wetland. Northwest and southwest China. Bhutan and Sikkim. Annual. 2～5 cm tall. Ovate, elliptic or spoon-form leaf. Scape shorter than rosette, rarely longer. 1～10 flowers, light purple or pink corolla, yellow throat. Flower diameter: 1 cm. Flower phase: June to Aug. Cold and humid tendency, heliophiles, water tolerant. Extensively in wet meadow of Tibet, 3200～4800m alt. Also in Himalayan countries. 8～25 cm tall. Obovate, oblong or sublanceolate leaf. Terminal capitulum, 4cm, blue-purple semiflorets, violet-brown or yellow tubular florets. Flowering: July to Sept. Cold hygrophiles, heliophiles, a bit tolerance to shade. South and east Tibet, 3800～4100m, barren, fir forest or forest meadow. Northwest Yunnan. North Myanmar. Himalayas. Evergreen shrub. 30～120 cm high. Oblong or elliptic leaves, dark green surface, densely scaled back in dark green surface, densely scaled back in dark red brown to brown. Terminal capitulum with 3～4 flowers, pink or white pink, June to Aug. Cold hygrophiles and heliophiles, a bit shade tolerance. 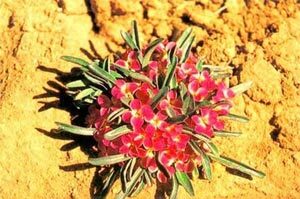 Tibetan endemic. Southeast Tibet, 3600～4300m. Forest, forestedge.